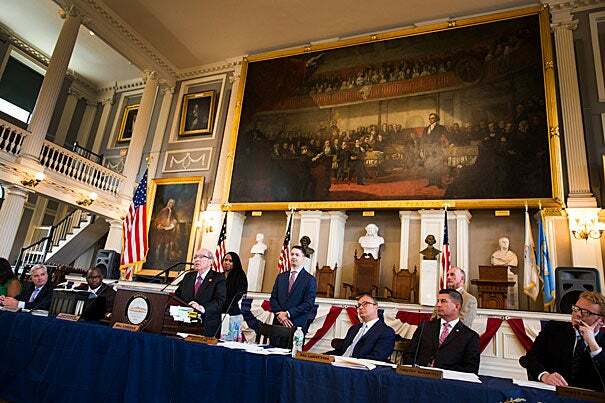 To honor its 150th anniversary, the Boston City Council recognizes Harvard School of Dental Medicine at Faneuil Hall. Dean R. Bruce Donoff (standing) addresses the council, while Councilor Ayanna Pressley looks on. The School is hosting an open house today. The Boston City Council has passed a resolution in honor of Harvard School of Dental Medicine’s (HSDM) 150th anniversary. Councilors Ayanna Pressley and Josh Zakim presented the resolution to the School’s dean, R. Bruce Donoff, D.M.D. ’67, M.D. ’73, at a session in Boston’s historic Faneuil Hall. “The Harvard School of Dental Medicine is a special place,” said Donoff. “As the first dental school of its kind, we’ve led the way in dental education, research, and patient care, and we are committed to integrating oral health and general health. HSDM was founded on July 17, 1867, and was the first dental school in the United States connected to a university and its medical school. It was also the first U.S. dental school to confer the Dentariae Medicinae Doctoris degree. The School was an early advocate for diversity — only four years after the Civil War, Robert Tanner Freeman, D.M.D. 1869, a son of former slaves, was in its inaugural class. He is widely believed to be the first black graduate in the United States to earn a degree in dentistry. George Franklin Grant, D.M.D. 1870, graduated from the School and went on to become the first black faculty member at Harvard University. “It’s really something to be assembled here in this august venue,” said Pressley, an at-large councilor. “In this room today we see democracy that is truly representative of our city. And when we think about liberty and freedom, you certainly can’t think about that without also thinking about equality. HSDM leads research in skeletal biology, where it is at the forefront of research seeking cures for diseases of bone and craniofacial tissues, with a focus on discoveries with implications that reach far beyond dentistry. A large component of the School’s mission is to expand access to oral health care to underserved populations. The Harvard Dental Center, which is part of HSDM, provides comprehensive care to thousands of residents throughout the Greater Boston region every year. The Harvard Dental Center Teaching Practices offers the community a range of dental care at an on-site clinic and through a wide variety of community-based affiliation agreements. Services are provided at a cost that is significantly lower than that charged at a private dental practice. Some services may even be free as a result of several on-going community based efforts. Over the past five years the Harvard Dental Center Teaching Practices has provided more than $3 million in care each year for the community in and around the Longwood Medical Area. “Providing access to care and reducing disparities has been and will continue to be an important part of our work,” continued Donoff. The School was originally in downtown Boston, close to Massachusetts General Hospital. In 1909, it moved to 188 Longwood Ave., and today is part of the Longwood Medical Area — a hub of teaching hospitals, medical education, patient care, and research. HSDM is hosting a Founding Day Celebration and Open House today from 3 to 5 p.m. at 190 Longwood Ave., Boston. All are invited to attend.